Back in the day.. No Wyz, and no Baby Boney Fido!! ​Dave and Liz have attended countless workshops and seminars, performed at private and public functions, and also competed in agility (Liz won 3rd place in the BAA Grand Prix finals in 2013). They keep up with their training and learning whenever they can. 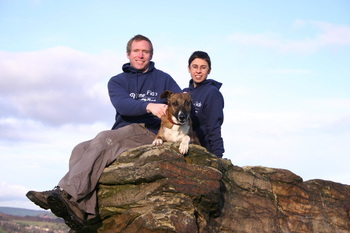 Since 2005 Dave and Liz have trained thousands dogs, helping them and their owners to lead harmonious lives together. They use scientifically sound methods, plus a little bit of artistry, that will help you and your dog achieve a solid grounding in obedience skills, good behaviour, agility, socialisation, and so much more! We are proud of the happy, waggy tails, and huge word of mouth recommendation that we have earned over the years, and look forward to helping you with your dog soon! Wysiwyg, or Wyz as she's known, is the best present a person could ever have! A gift from a friend (thank you! ), she has plenty of cuddles and fun to give and give. Now, at nearly 8 in 2016, she is still going strong, and is often mistaken for a much younger dog! Wyz is a perfect sloth at home, but is up for it once shown a tuggy or some food :-) A fun-loving dog, she is a fantastic pretend gun-dog, great at agility, and is always keen to learn new tricks - especially if there's a tasty treat or tuggy game involved! Take a look at the agility page for a peek at Wyz competing with Liz in a team event. Freddy is the dog that started it all back in 2005. ​In 2002, we just 'popped along' to Thornberry Animal Sanctuary to walk some dogs. Well, he only went and thumped his great big paw on Liz through the bars. It was love at first sight. "Can we take him home?" And that was that. Liz found that Freddy really enjoyed learning new things, especially when there was a tasty treat or the throw of a toy involved. They dove into learning all sorts of crazy tricks; one of Liz's favourites (there were many favourites) was Freddy walking backwards around and through Liz's legs. 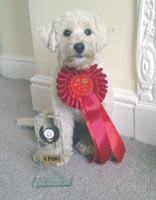 ​Freddy has strutted his stuff at many summer fairs and various shows. Both Dave and Liz have competed in agility and won lots of rosettes with Freddy, and for a non-gun dog, he's not a bad retriever. In 2014, we finally had Freddy DNA tested to find out just what Freddy is - NO, not a 'dog', smartypants - which breeds likely make up the dog that is Fred. Turns out, he is GSD, a lot of Greyhound, quite a bit of Australian Shepherd dog, plus many other little bits and pieces, including a Mini-Poodle!! Genes, eh?! *Our Fred sadly passed away in 2015, at the grand old age of over 13 and a half. Here's Freddy in his heyday (8 and a half here.) He has had a lot of heydays...! Freddy showing off his gun dog skills; not bad for a GSD x greyhound x Australian Shepherd x ... ! We hope you've enjoyed reading a little about who we are and what we do, and look forward to helping you with your dog soon! Boney Fido Dog Training is covered by Cliverton insurance for £5M Public Liability insurance and £100K Professional Indemnity.